Choose the Gift Certificate option that works best for you. We can email the Gift Certificate to the recipient for you or you can print the Gift Certificate out and present it yourself. Electronic Gift Certificates are immediately emailed to the recipient of your choice. Delivered in seconds and elegant in design . . . just tell us the email address of the recipient. Print out our elegantly designed Gift Certificate now and have something to gift wrap yourself. To get started, you'll just need to tell us the recipient's email address. 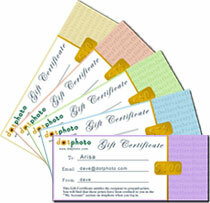 *Gift Certificates can be used only when you are logged in to your account.